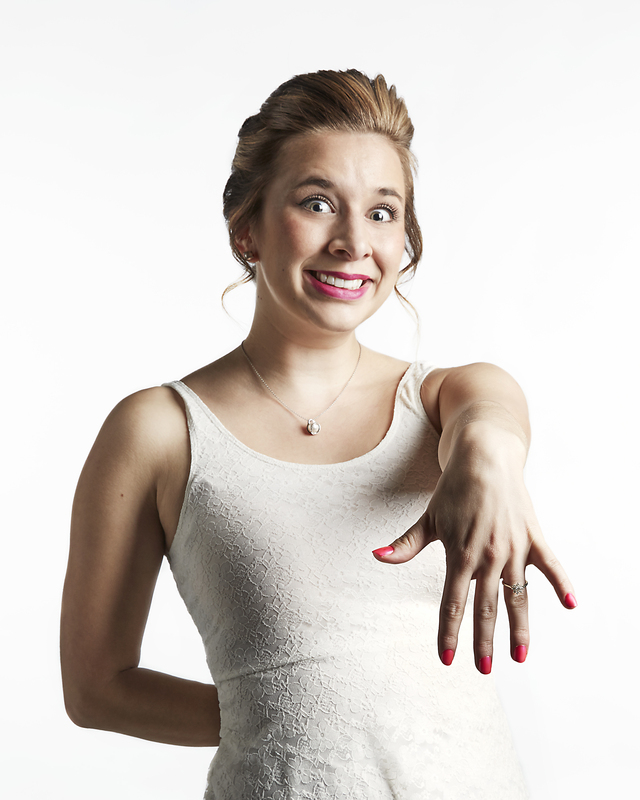 Ok, to be completely honest: Bride or Die was probably one of my least anticipated shows this Ottawa Fringe season (and that hurts me to say, because, if you’ve ever met creator-performer Ashley Rissler then you would know that she is the loveliest human being). Admittedly my initial hesitation stems from the show’s subject matter, namely the institution marriage in the western world and women’s place inside it, due the challenge it poses in thoughtfully exploring its many intricacies. Simply put, it’s tough to make an artistic comment on the capitalistic nature of Marriage and the patriarchal values it can sometimes encourage in defence of women without tearing down other groups of women in the process. That being said, Rissler’s script is much deeper than the title might lead you to imagine and with a little bit more development time this piece has the potential to be a knock out production. The show takes place in the dressing chambers of a young woman as she’s getting ready for her wedding. We are guided through her daily bridal routines and many, many check-lists while also reminiscing about the moments leading up to her big day. The young woman on stage has been anticipating her nuptials for quite some time, we are told, yet slowly but surely we start to see the cracks in her façade and the hard realization that maybe this won’t bring her the joy and happiness she believed it once might. My biggest criticism of this show is that in its current iteration the protagonist does not show us enough vulnerability on stage to make her final monologue truly redeeming. When it comes down to it I don’t feel sorry for her when she realizes that being a bride isn’t all that it’s cracked up to be. Why? Like I initially feared, there are too many moments spent on stage tearing down other groups of women and our protagonist comes across as very superficial and not always very likeable. For example, when she throws shade at one of her friends for gaining too much weight to be a bridesmaid; or her fiancée’s sister who gets engaged a month before her wedding; or even the female sportscasters who are alleged to look like pornstars (or that they’d exchange sexual favours for employment); when comments like these are not balanced out with some reasoning for this abrasiveness it’s hard to find sympathy for this character who, I think, is meant to come to some sort of revelation and understanding. The final monologue really saves it for me though. It’s beautiful both in its execution and in its imagery of the water and sand while also being incredibly painful in its symbolic nature. In this moment the character describes having a dream where she and her fiancé are at a beach and, as people might normally do, she allows her fiancé to bury her in the sand. You can see that Rissler is a gifted performer in the way that she switches from this high energy bubbly individual to a more subdued presence in this section where she instead amps up the feeling of panic and anxiety as her character’s fear starts setting in. The feelings of being constricted and trapped are then driven home when the character finally puts on the beautiful white dress that’s been hanging there the entire play- we realize with some profundity that the dress is in the very same shape as the sand the character has just described in her dream. Like I said, Rissler is a great performer to watch on stage. She’s funny, engaging, and brings a great physicality to the piece as a whole. The audience participation also works really well in her favour as she picks different spectators to enact her proposal and bachelorette party, each with hilarious results. I also agree in that Rissler has done a great job with incorporating a more contemporary vibe into her show and it certainly does speak to millennials. I can understand the difficulty that comes along with trying to tackle the longstanding notion that marriage is the single most important day in a woman’s life and all the oppressive connotations (not to mention the capitalistic opportunities) that have come along with that thought. However, bringing down other women, other allies, simply for comedic purposes is not necessarily going to strengthen your discourse unless it’s used in such a way as to bear evidence to the fact that young women are socially conditioned to compete against one another (a good example, though not explored deeply enough, is when Rissler mentions TLC’s Four Weddings) almost literally from the day they are born. This layer isn’t quite clear in Bride or Die so it doesn’t quite reach true transcendence for me yet, but with a few rewrites it certainly will.